soooo TWISTED_ANGEL at yer sèrvice! hi everyone!! 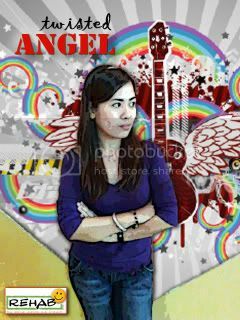 ur angel is here! kikayness to the nth power.....my fave sport is shopping...nyahahhaa!! drinking life... kesa sa lab life laging heartbleed lang eh...kaya mas love ko ang inom! kasi love din ako nito! nyahahaha!! mind ur own business scratch ur own galis!!! but in fairness may sense din ako kausap try nyo lang! hopeless romantic - don't need more explanation... ahehehee...basta yun na yun! living life as if its gonna be the last! last bottle of beer??? wattaf%$!! i could be your best friend or your worse enemy....weeeeeeeeeeeee joke lang! mas gusto ko madaming friends! last na hirit! syempre! i can't live without art and music!! ART brings color to my life and MUSIC feeds my soul!!! LIVE LAUGH LOVE...........cinnamon rak en roll!!!!!!!!! uy tara subukan natin to! i wanna try lomography, too!! !